Despite the increasing enterprise interest in DevOps, it has taken some time for the ITSM community to fully embrace the DevOps philosophy, along with the modern development approaches it draws from. 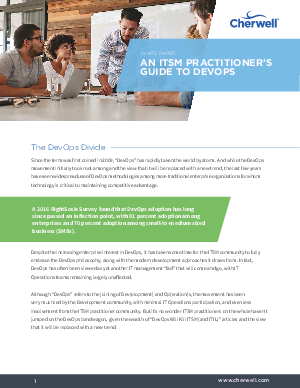 In fact, DevOps has been viewed as yet another IT management “fad” that will come and go, with IT Operations teams remaining largely unaffected. Although “DevOps” refers to the joining of Dev(elopment) and Op(eration)s, the movement has been very much led by the Development community, with minimal IT Operations participation, and even less involvement from the ITSM practitioner community. But it’s no wonder ITSM practitioners on the whole haven’t jumped on the DevOps bandwagon, given the wealth of “DevOps Will Kill ITSM (and ITIL)” articles and the view that it will be replaced with a new trend.